Here are the first five of the ten megatrends! The second five will be in the next post. Five of these 10 trends revolve around energy: energy efficiency, zero-net-energy, cloud-based (and data-driven) energy management, energy performance disclosure, and solar power. These trends are largely impelled by two practical considerations: first, for most buildings, energy is the largest uncontrollable operating cost and needs to be reduced; second, the growing understanding of a connection between building energy use and global climate change means that corporate social responsibility and local government policies will result in rising demand for building energy efficiency solutions. This is true regardless of leadership dynamics at the Federal level. 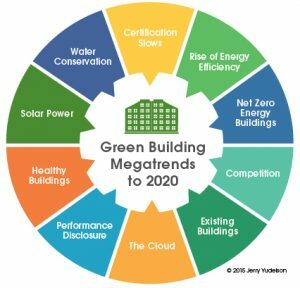 Green building in North America, Europe, the Middle East, and Asia-Pacific will continue to grow in commercial building market segments, especially for larger office buildings, corporate real estate, and high-end university and government buildings. But the slowdown in US commercial project certifications since 2012 has meant that projects outside the US now make up nearly 35% of the annual total LEED certifications. The new and more costly prerequisites found in the now required LEEDv4 indicate that nothing will change this picture. In many ways, energy efficiency is a stronger trend than green building certification. There are still huge opportunities in energy efficiency, and most are concentrated in just 25% of the building stock, according to FirstFuel Software. A more cost-effective approach to upgrading existing buildings should attempt first to take advantage of this concentrated nature of efficiency opportunities. 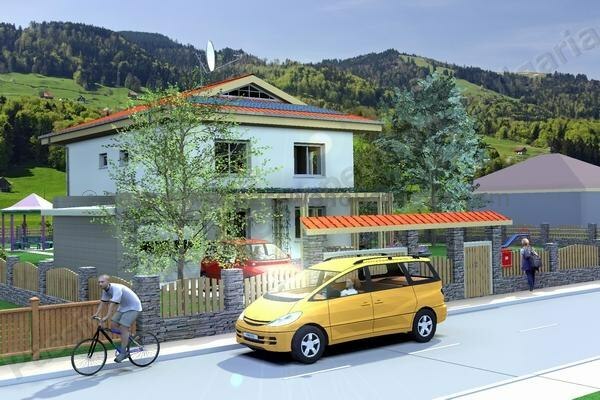 Zero-net-energy buildings are become increasingly commonplace. It seems that everyone wants in on the “net zero” opportunity, to judge by the number of specialty conferences around this topic in 2016. If a project wants to be newsworthy, it needs to incorporate something NEW and “net zero” seems to be the ticket. In the U.S., LEED may see heightened competition in existing ratings from the BREEAM “Building in Use” rating system, introduced into the US market in June of 2016. There are also new entrants in specialized niches, such as shopping centers or office interiors. In 2016, the federal General Services Administration once again affirmed using both LEED and Green Globes for its projects. But the biggest competitor of all rating and certification systems is the DIY (do-it-yourself) favored by many owners or the “LEED certifiable” approach that uses the LEED system for design guidance but not to bother certifying. Megatrend #5: Building owners sharpen their focus on efficiency gains. With new construction certification basically flat, the existing building market is getting greater attention, particularly with energy-efficiency retrofits and a renewed focus on using the Energy Star system. More owners of existing buildings will implement energy efficiency retrofits in 2017 but will pass on LEED-EBOM (or BREEAM) certification. For a fuller discussion of these 10 megatrends, see my article in the January 2017 issue of HPAC Engineering, www.hpac.com. What’s your “Top 10” Trends list for green building in 2017?